Please note: this article contains spoilers from a previously unknown area in Kingdom Hearts III. The Kaaboo Music Festival in Del Mar seems to have dropped an olympic surprise appearance from Kingdom Hearts III. Kaaboo, which takes place in San Diego from September 14-16th 2018, is a festival which boasts an adult escape, uniquely curated to appeal to all five of your senses, with world-class music, hilarious comedy, incredible cuisine, craft libations, inspiring contemporary art, and personal indulgences. 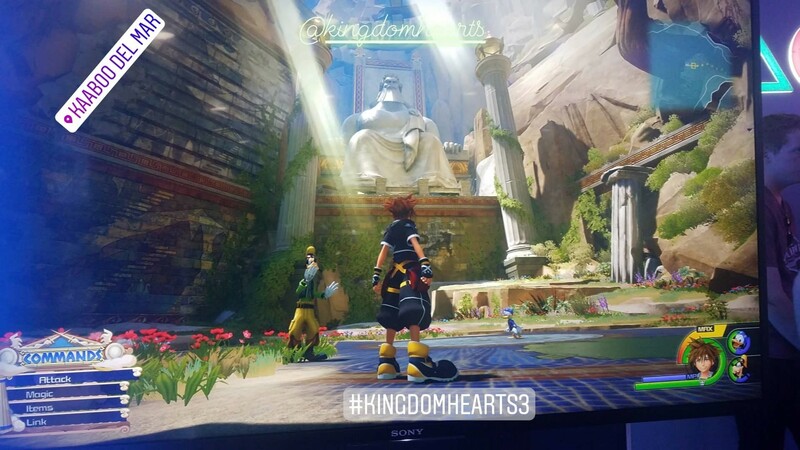 It doesn't really seem like a place where Kingdom Hearts III would be available at, however according to an Instagram story by rod83092 it seems that fans are getting their first glimpse at a new area of Olympus. Playstation brought this demo to promote the game as part of their Road to Greatness tour, which showcases new and upcoming titles. This location is found in an extended version of the Olympus demo, so it's very exciting to see more locations from the game prior to the games English launch on January 29th 2019. According to rod83092, the demo starts in the city, which he believes to be Athens. Sora heads into the mountains, passing through various environments such as those seen in the E3 2015 trailer. The objective is to reach the summit, where Sora then does battle with the Rock Titan. Oh neat is that Zeus? I'm actually excited to finally meet him in person. Can you please edit your post. The name you included can be viewed from the Activity page and can 1) spoil those who don't want to be and 2) give people the wrong impression that Zeus is actually in the game (which is unknown). Okay I edited my post. I don't quite understand how an event like this got access to a spoiler image. Weird. Thanks. It's annoying that this section can't be removed from the activity log but "Oh neat is that Zeus?" was fully visible and I didn't want people to think there actually was Zeus and that they were just completely spoiled on it so thank you for your cooperation. Either there's a new demo there which wow if true, or there's an area that no one has found in the original demo until now. This is beautiful. Despite how much we've already seen of Olympus, every new area of this game looks incredible. I can't wait to dive in to this for myself in a few months. This looks so good, hoping for more leaked pictures lol. Wow! This world is HUGE. This is looking really beautiful, too! Really curious as to how and why this is taking place? Really excited though. Kinda worried that these demos are everywhere. What if it leaks and some tech savy person data mines it. Demos are only in places where there are hundreds of people watching, as well as staff and security cameras. It is extremely difficult to plug in a USB or something and copy a demo over, and even then there may be additional security on them like a product key meaning it won't work unless its on that specific console. Secret area or new build? Extended rock titan demo, going by khInsider post on twitter. Dandelion asked the source about it. Playstation is one of the partners of Kaaboo Del Mar, so they brought a bunch of demos to promote newly and upcoming games. It might be safe to assume this extended Olympus demo will also be available at TGS next week. Wow, interested to find out more! And if we're seeing this demo here, where else we might see it make an appearance. Paris games week and jump festa, and maybe some other smaller events. Could be TGS on out. But I think itâ€™ll depend on how long this version is. This event probably wasnâ€™t a place where people were coming in hordes just to play this game, so they were likely afforded more time. Busier events might not be as lucky or they may just have to choose one of the two demos rather than playing both. I wonder if any new cutscenes were shown? There's also Paris Games Week, Jump Festa and various PAX's, to name a few.